Rock and Wrestling have also had a loving relationship with each other. Even to the point Hulk Hogan had a cartoon in the 80s called Rock N’ Wrestling. (Nerd alert!) Over the years many big name rock and metal artists have lent their talents to the sport. Motorhead have provided Triple H with 3 entrance themes throughout his career and have played him to the ring at Wrestlemania. But it also goes the other way with many wrestlers sharing their love of rock and metal over the years as well. If you want a current example, go check out Seth Rollins’ social media accounts, as he is one of a number of WWE Superstars regularly promoting his love of heavy music. Naturally it made all the sense in the world to have WWE team up with the Download Festival to bring the two worlds hurtling together. As we get ready to prepare for our 3rd year of NXT laying the Smackdown at Donington, we are going to give you our 10 reasons not to miss NXT at Download 2018. Current NXT World Champion Aleister Black is no stranger to the world of metal and Donington in general. Making his debut appearance at Donington last year inside the ring, while outside of it finding time to introduce Code Orange onstage, watch Venom Prison and participate in a q&a curated by Will from Creeper. Aleister Black is the living embodiment of heavy metal. When he’s not kicking faces off, he’s moshing with the rest of us. 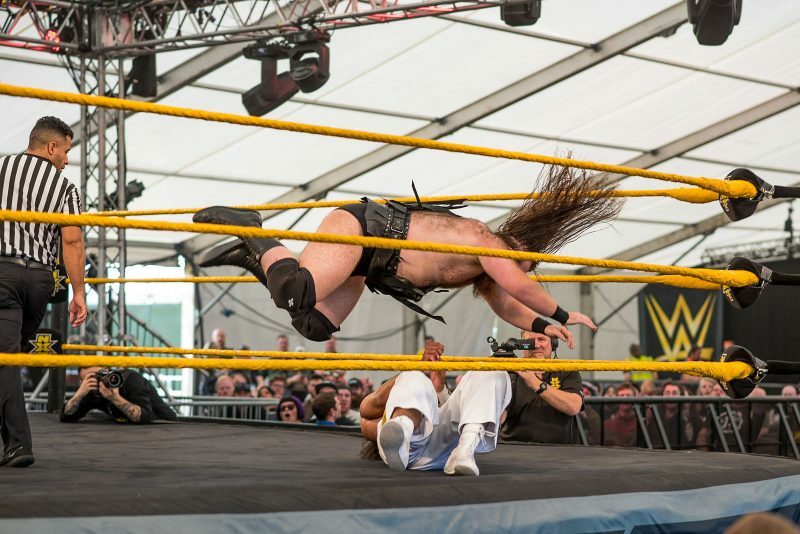 In it’s first year in 2016 NXT rolled out a couple of big surprises. Firstly we got to witness the first ever match in a WWE ring from the glorious one Bobby Roode, who debuted in an untelevised bout in front of an raucus crowd. The same weekend, the big man himself Triple H showed up and whipped the crowd into a frenzy before collecting an award on the main stage from Dave Mustaine of Megadeth. With no matches and only a handful of talent announced in advance the opportunity to see something unexpected is always high. Last year UK star Mark Andrews was performing a set with his band Junior when UK champion Pete Dunne appeared onstage and attacked him, which lead to Andrews flipping off the stage and starting a brawl. While obviously this was all a work (a term used to describe something as staged for you non wrestling fans), the action won’t always be confined to the ring. Ricochet, or King Ricochet as he is sometimes known is one of the most exciting wrestlers in the world. He made his in ring debut for NXT at NXT Takeover: New Orleans where he participated in a 6 man ladder match. It’s worth noting that he is on this list because he truly has to be seen to be believed. Part pro wrestler, Part stuntman, Ricochet seems content to fling himself around in some of the most awe inspiring, gravity defying ways you have ever seen. Its safe to say that when June rolls around, he will be looking to make the hallowed grounds of Donington his personal playground. The Undisputed Era are one of the Best Things going in NXT right now. Adam Cole, Kyle O’Reilly, Bobby Fish and Roderick Strong are one of the most dominant and exciting groups in all of wrestling that also happen to pretty damn great in the ring. Recently they have entered into a feud with the UK champion Pete Dunne who may be calling upon his British Bretherin in Tyler Bate and Trent Severn to lend a hand. Which has all the makings of a good old fashioned showdown between the best of British and the best of the U.S going toe to toe. Not only will this be heaps of fun, but it will also be some of the best wrestling you will see anywhere ever. As we know with any festival, as much as they try to cater to a wide variety of people, there will always be moments when you are left not wanting to see something on the bill. Well NXT gives you the chance to see something different, it offers an alternative to pop your head in a give something else a try. Whether you are a die hard wrestling fan or a wrestling newbie, getting to see NXT live in the middle of a music festival is a unique experience that gives the audience a little extra bang for their buck. Plus if it rains, its undercover (if you can get close enough to the ring) so there’s also that. The NXT Womens Division has provided us with some of the best female talent in recent years. Although a lot of the division has now graduated to the main roster, there is still a great number of hard working ladies left in NXT. Kari Sane, Candice Le Rae, Biance Belair, Dakota Kai, Lacey Evans and the current Champion and Former UFC star Shayna Baszler are all present and correct and will be stepping into the ring to blow minds this June. Its not a stretch to say that NXT is the current go to brand in WWE for high quality wrestling. With a roster that is an embarassment of riches. NXT superstars regularly steal any show they are on. Featuring superstars such as EC3, Velveteen Dream, The aforementioned Ricochet, Tomaso Ciampa, and wrestling machine Johnny Gargano, you will not find a better wrestling roster this side of Japan. NXT is very much the counter culture to the main WWE product, with a feeling very much like the Headbangers Ball to Raw and Smackdown’s TRL. It makes sense then that WWE uses a lot of rock and metal artists for their NXT presentation. Featuring the likes of Creeper, Marmozets, and Power Trip as their pay per view themes, as well as having Cane Hill, Code Orange and Lzzy Hale actually perform at their events. Its possible then that we could see some of that crossover at Download with some bands on the bill getting in on the fun too. The superstars of NXT line up alongside Avenged Sevenfold, Guns N’Roses, Ozzy Osbourne and approximately one hundred other bands on the line up of the 2018 Download Festival, live at Donington Park from the 8th – 10th of June 2018 (campsite open 6th – 11th June). Tickets are still available for Download 2018 and can be obtained right here. Stay tuned to Rock Sins for lots more build up to the 2018 Download Festival!